Masked Palestinian militants from the Al-Aqsa Martyrs Brigade, an armed wing linked to Fatah, hold up weapons near Nablus, Jan. 10, 2017. Photo by Nasser Ishtayeh/Flash90. 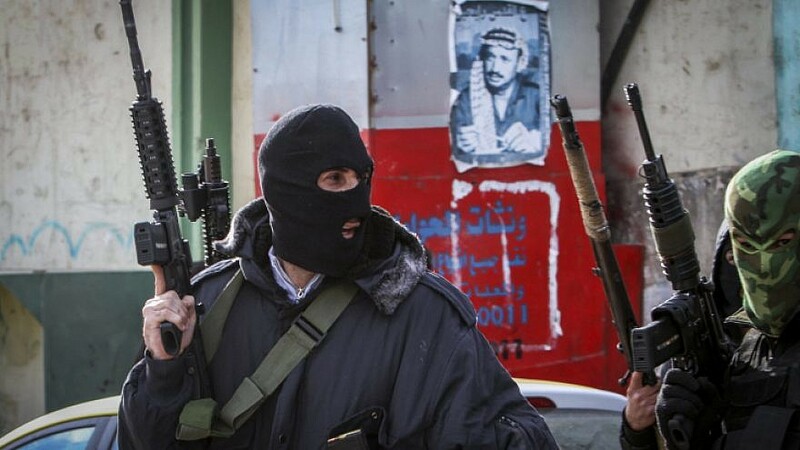 The Palestinian Authority, led by Mahmoud Abbas, pays terrorists and murderers who have been imprisoned for more than three years a higher salary than it pays 40 percent of the its law-abiding public employees. The decision to penalize its law-abiding employees in favor of continuing to pay the full salaries of the terrorist prisoners, released terrorist prisoners, the wounded terrorists and the families of the dead terrorists, is not surprising considering how highly these terrorists are regarded by both the Palestinian Authority and Abbas’s Fatah party. As Fatah Revolutionary Council member and official Fatah Spokesman Osama Al-Qawasmi explained, in the eyes of Fatah the terrorists are “heroic” and “brave,” and together with the dead terrorists (the so-called “martyrs”) and their families “will remain the diamond in the crown” of the Palestinians. Palestinian Media Watch reported on the P.A.’s decision to cut the salaries of the law-abiding P.A. employees, which came in response to the decision of Israel’s Security Cabinet to implement Israel’s new Anti “Pay-for-Slay” Law and deduct 502 million shekels ($134.2 million)—the sum that the P.A. admitted to paying to terrorists and released terrorists in 2018—from the taxes it collects and transfers to the P.A. In response to the decision of Israel’s Security Cabinet, Abbas announced that the Palestinian Authority will refuse to receive any of the taxes collected by Israel. The taxes that Israel collects and transfers to the P.A. amount to, on average, 670 million shekels/month. Cumulatively, they account for almost 50 percent of the P.A.’s annual budget. By refusing to accept the remaining taxes, the P.A. is self-imposing a significant financial crisis. Alongside the announcement of the cut in pay to the public employees, the Minister of Finance’s announcement exposes the fact that 40 percent of P.A. employees earn less than 2,000 shekels/month (about $535). While this figure in itself is not of great significance, it demonstrates the reality that the P.A. pays terrorist prisoners who have been in prison for a cumulative period of three years more than it pays 40 percent of its law-abiding public employees. The salaries the P.A. pays to terrorist prisoners increase the longer time a terrorist spends in prison. While the starting salary is 1,400 shekels/month (about $374), it increases over time to 12,000 shekels/month. Accordingly, a P.A. employee who earns 4,000 shekels/month will apparently only receive 2,000 shekels, a salary cut of 50 percent. 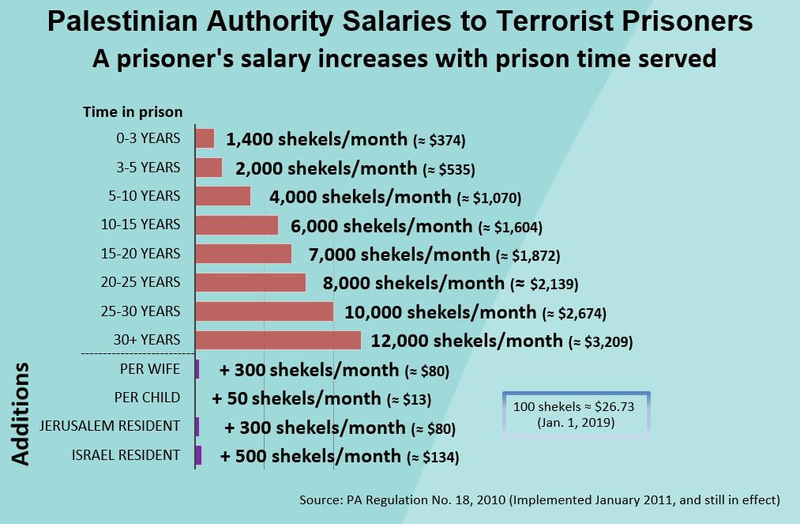 Its ministers, on the other hand, who receive, for example, a salary equivalent to that of a terrorist prisoner who has spent 30 years in prison—i.e., 12,000 shekels/month (about $3,209)—are still going to receive at least 10,000 shekels/month (about $2,674), a salary cut of less than 17 percent. The financial crisis the Authority is now facing, and which requires the cuts in the salaries of its employees is entirely self-inflicted. The origins of the crisis lie with the P.A.’s “Pay for Slay” policy and its squandering of hundreds of millions of shekels to pay financial rewards to terrorists. The crisis is now being compounded by the decision of Abbas to reject more than 630 million shekels (nearly $175 million) a month in potential tax revenues, just as a means to display his dismay at Israel finally taking steps to prevent him from using the tax revenues to reward terrorists. While the decision to penalize the P.A.’s law-abiding employees is not surprising, it clearly demonstrates the terror rewarding priorities of both Abbas and the P.A.